Giraffes are such beautiful animals. The possibility of sketching them motivates me to get over to the zoo. I think this is my fourth sketch of giraffes in two years. For this sketch I stood across the road and sketched from a distance. I wanted to get the big picture of these magnificent animals in their small enclosure with admiring people and foliage surrounding them. I worked in a 8 X 11 inch Moleskine sketchbook with black paper. 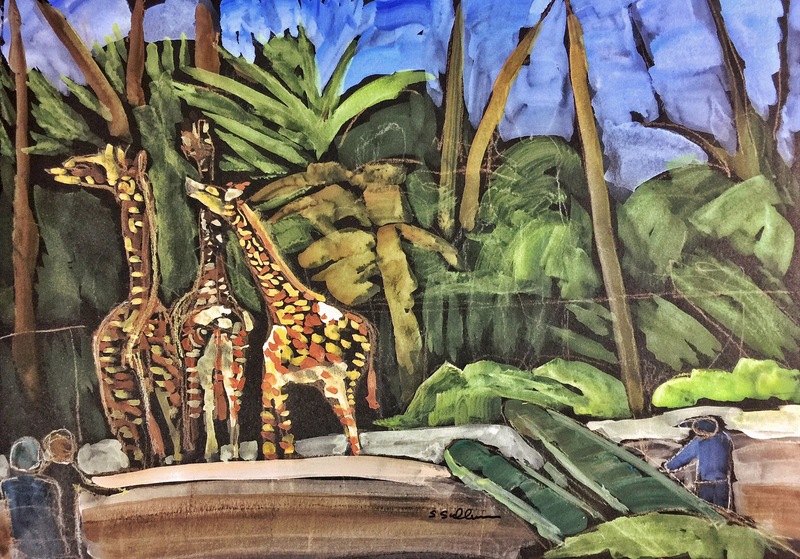 This entry was posted in Groups Interacting, Landscape, Telling a Story and tagged Giraffes, Gouache, San Diego, San Diego Zoo, zoo. Bookmark the permalink. Love the color, texture and integration of this painting! Thank you Terry, it was fun doing it.